Did you know that one of the most common causes of hair damage is from coloring treatments? Over-processing hair or applying color incorrectly can cause serious damage that impacts not only the look of your locks but the health of your strands and scalp. 1. Seek help from the professionals. One of the best ways to avoid damage during hair coloring is to visit a professional stylist who is experienced in color treatments. Not only does this ensure that the color is mixed and applied correctly, but it also helps you avoid costly mistakes in application that can cost you time and money as well as jeopardize the health of your hair. 2. Don’t leave color on too long. If you plan to color your hair yourself, make sure that you follow the directions for application. Leaving the coloring treatment on your hair too long can not only cause damage to your strands but can also impact the health of your scalp. 3. Increase time between colorings. 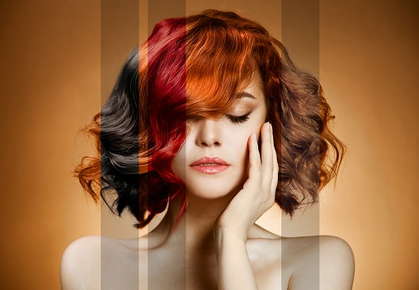 Another great way to prevent damage to your hair from coloring treatments is by prolonging the time in between colorings. Using shampoos and conditioners that are formulated for colored hair can help you reduce fading, allowing you to wait longer between color treatments. 4. Just touch up the roots. If you just want to refresh your color you may not need to dye the entire length of your hair. Ask your stylist if they think a root touch up is right for you. Our coloring experts are ready to help you get the look you want without damaging your locks. Contact us today to make an appointment with one of stylists.